Banjo, a labrador/golden retriever cross, has joined the Calvary team. Calvary Hospital has just added its newest "employee" to its Bronx campus, Banjo, a facility assistance dog. Bred and trained at Canine Companions for Independence, Banjo is a 3-year-old labrador/golden retriever cross. 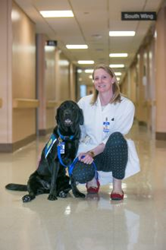 As a facility dog, Banjo is an expertly trained dog who partners with a human facilitator working in a healthcare, visitation or education setting. Facility dogs are different from typical family pets; they receive extensive and specialized training and are partnered with professional facilitators to primarily provide structured, practical "task-oriented" interactions to groups of children and adults with disabilities in healthcare, education, and other professional settings. Banjo was matched with his Calvary facilitator, Shannon McCourt, LCSW, during an intensive two-week training program on Long Island, New York. Shannon is responsible for handling and caring for Banjo. In fact, he lives with her. stress that patients, family members, and staff feel on a daily basis is quite high. Banjo’s primary role at Calvary is to help people decrease their stress. In the few weeks since Banjo joined the Hospital, he and Shannon have been enthusiastically received by everyone at the 200-bed Bronx campus, the largest of Calvary’s four inpatient locations. Canine Companions for Independence provides expertly trained assistance dogs to children, adults, and veterans with disabilities. Established in 1975 in California, Canine Companions is the largest non-profit provider of assistance dogs in the United States. Canine Companions is recognized worldwide for the excellence of its dogs, and the quality and longevity of the matches it makes between people and dogs. There is no charge for the dog, its training, or on-going follow-up services. For more information, visit http://www.cci.org or call 1-800-572-BARK. Since 1899, Calvary Hospital has been the nation’s only fully accredited acute care specialty hospital devoted exclusively to providing palliative care to adult patients with advanced cancer and other life-limiting illnesses. Each year, thousands of patients receive CalvaryCare throughout the greater New York area. To learn how Calvary can help you and your family, please visit http://www.calvaryhospital.org.